I really liked that place. Everything was good. Employees were cheerful and kind, rooms were clean. And it has great location. Only bad thing was internet problem but it is not a big problem. Great stay at dizzy downtown ! Would definitely recommend and I will 100% stay here again when I return to Krakow . A wonderful location easy to access everything by foot and lots of amenities close by eg coffee shops supermarkets eateries . Bathrooms basic but very clean and no long wait to use facilities. The staff were great . Overall this hostel is great if you are on a budget and want a central location I couldn't speak more highly of it just a great hostel . 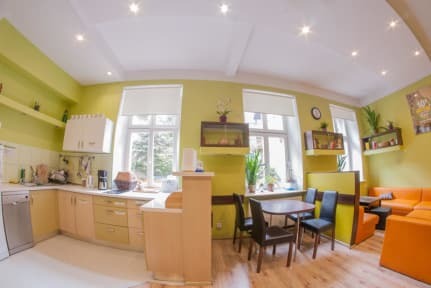 An excellent hostel in Krakow for someone on a budget. Bit of a walk to Old Town, but it's worth it. Rooms and facilities are very clean - lots of space! Definitely a bargain. We loved our stay at this hostel. We booked the private apartment. Very impressed we had free tea,coffe,sugar and breakfast. The apartment was very warm and cosy. It was great having a little courtyard to be able to have a cigarette in rather than out on the street. I enjoyed my stay here. I had my own room, which was excellent value for money. Got a bit lost coming from train station on arrival, maybe my bad sense of direction. But I would research that before your stay. Cereal for breakfast supplied so you just need to buy milk. Tea, coffee sugar also supplied. Nice and quiet, slept well. 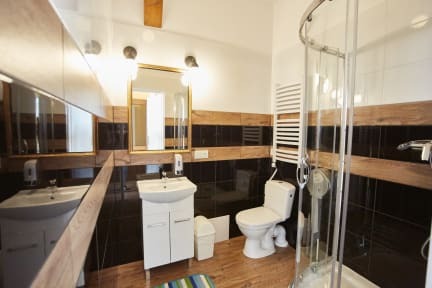 And an excellent bathroom. Not very friendly but excellent location. The staff is not very helpfull. Cleaness is OK. To have some rest and to discover Krakow. I recommend. Had a pleasant stay. Staff were friendly (except for the evening shifter guy that was working on 30 March) and helpful. The common area (combined with kitchen) was too cozy to be spending time in. I don’t know what exactly, but something was definitely missing as it did not feel like a hostel. I was, nevertheless, pleased with the services they provided. I stayed in a 6-bed-dorm. It was clean. It was ok. But really annoying are the showers on the floor directly in front of the room. Everytime anyone was taking a shower it was like he was taking this shower directly beside my bed. Quiet, cheap place to stay. Close to the center, just a 5 min walk. The beds squeaked and felt as if they almost fell apart. There was no common area because it was under renovation. There is no kitchen and not even cutlery. Shower and bathroom were in the hall which I liked but on the second day they were dirty and didn’t get cleaned throughout the day. They door to the dormitory was almost all the time opened. But the lockers were big enough that my carry-on suitcase fitted in there.